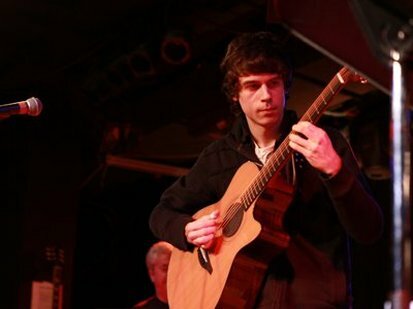 Guitars Alive X featured guitarist Jamie Dupuis with special guests Northern swing and JoAnne Landry on Saturday, March 31st, 2012 at 7:30pm. Participating school guitar ensembles this year were: Levack Public School Guitar Ensembles; Churchill Public school ensemble, Lasalle Secondary School Guitar Ensemble, St. Charles guitar ensemble, the Lasalle Bluegrass Duo and three guitar ensembles from Cambrian College and Laurentian University. Following an intermission Guitars Alive presented Jamie Dupis - featuring a unique program of music, including works by Domeniconi, Robinson and origional compositions. Jamie Dupuis a Composer/Guitarist was born in New Liskeard, Ontario. After 7 years of serious studies and dedication to music and guitar he has recorded his first studio album “Inspired by a Dream”. The album was created with the influence of many different musical genres. One of his recent accomplishments was winning an international competition in Hollywood. He placed 1st in the “Full Ride Scholarship, 2011” at the Musicians Institute of Contemporary Music, competing against many artists worldwide. Jamie obtained a College diploma in Music Performance and studied classical guitar with renowned guitarist Philip Candelaria. He won the top guitar award at the “Senior Awards” concert for 3 consecutive years while studying in the performance program at Cambrian College. He won first overall at the Sudbury Kiwanis Festival (2011) and at the Capreol Guitar Competition (2010). He was a featured performer in the “Guitars Alive” concert in Sudbury (2010-2011), “Alla Grande” guitar festival in Ottawa (2011) and the Sudbury Jazz festival (2010). Jamie had the honor of being interviewed by Markus Schwabe host of Morning North on CBC Radio for his win in Hollywood. Jamie’s performances are greatly influenced by such styles as rock, metal, jazz, blues and classical. His inspiration is derived from such artists as Jason Becker, Tommy Emmanuel, Keith Jarrett, Buster B Jones, Roland Dyens and Carlo Domeniconi. This has led to his unique stylistic creation and sound with the guitar. Jamie is always working on new projects and collaborations and will follow his dream by attending MI in Hollywood, California.